It was that easy--with those words, Sean Franklin of Blood & Iron and myself (RJ McKeehan of South Coast Swords) set out to accomplish the task of sparring with real sharp swords safely. There was no machismo exhibited, no pride on the line. We simply wanted to experience the nuances of sharp-on-sharp contact. More importantly, we wanted to document the process and share it with the HEMA community at large. A bit of background on us: Sean is one of the head instructors at Blood and Iron, and I am one of the head instructors at South Coast Swords. Sean trains heavily in the Meyer tradition, but has a wide range of skills in HEMA ranging from Thibault rapier to Ringen (grappling). I specialize in Liechtenauer longsword and Leckuchner messer, but also train in several other weapons. What follows is an interview to show both of our perspectives of the experiment. While there is some overlap, I think we were both surprised by different aspects of the test. What were your thoughts upon the start of the project? What were you hoping to accomplish during the experiment? Sean: “Other sharp sparring videos I have seen are all done without gear. While this can help you understand the psychology of facing a sharp blade, the fights are all very hesitant as each participant is being extremely careful not to put their partner in any real danger. Which is exactly what that exercise calls for, but massively changes the dynamic of the fight. I wanted to emulate the feeling of the blades interacting more than the psychology of the fight. Everyone says that the “bind” is the critical missing piece in sparring. What were some of the other significant differences you experienced in comparison to “normal” sparring? Sean” “More or less, it felt much the same. The big differences occurred when two swords were in contact and one of the swords was brought extremely offline, such as when rolling around for a cut to the other side. Normally, with a blunt sword, the sword that is kept online tends to slide towards the cross of the sword brought offline, but with the sharps in a correct bind, the sword moves offline with the other sword. “This is important for two reasons. One is that it keeps contact with the weaker part of their sword instead of sliding up to the extreme strong. This means that you have a higher chance of winding the sword into a thrust as they try to cut around. RJ: “The sparring was closer to feder play than either of us expected, however we definitely noticed some differences. Because the swords had more binding sensation than normal, it was extremely easy to feel when your opponent was “soft” or “weak.” As a result the duplieren and mutieren were easier and more natural to accomplish. We also found that hand pressing was easier to target and had a certain “cooperative” effect to it. While conducting the experiment, were there any unexpected results for either of you? RJ: “The bind we were expecting was absolutely evident, however we experienced some very important subtleties that are generally not discussed when talking about the bind of “real” swords. It’s generally assumed that the bind occurs any time the edges are in contact with each other, however we found that this is not the case. For a good bind that really makes the swords “stick” (and actually affects their interaction), the edges need to be nearly perpendicular to each other, and there must be sufficient pressure. Any time both edges made contact an angle not perpendicular to each other, the bind was far weaker and had less effect on the interaction of the blades. As soon as you begin to release pressure in the bind, the opponent’s blade can move freely. 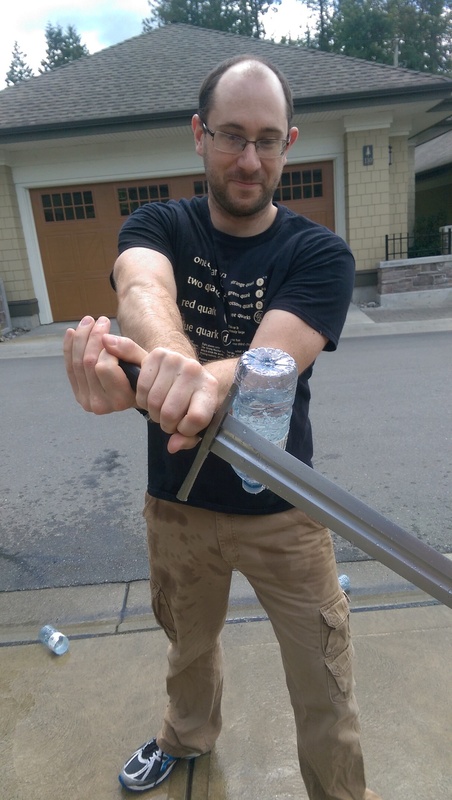 Sean: “I've read many times about how the sharp edge restricts the sword's ability to slide, but after using sharps with higher intent I think this is an artificiality of using the sharps at slow speed. When both swords had their tips pointed forward I didn't feel the effects of the sharp edges in the least. Only when the swords were brought 90 degrees to each other did the sharp bind have a significant effect. “I suspect this comes from two reasons. One is that the more orthogonal (square) the swords are the more the edges ‘lock’ into each other. 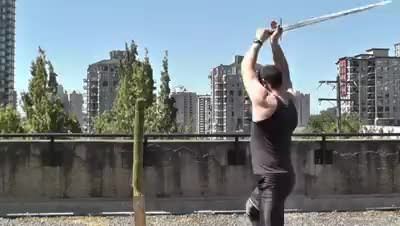 The other is that with the swords at 90 degrees the bio-mechanics of our positions leads it to be much more difficult to exert force in the direction that would cause the swords to slide. But… sharp swords kill people! How did you feel about the safety of the test? Sean: “RJ and I are both very experienced cutters, we know how much it takes to cut through clothing. At the level we were sparring at (hard, but controlling the power quite a bit on the strikes that landed) at no point did I feel I was in any danger. The swords were also only sharpened to 400 grit, and you would be extremely hard pressed to make a sword at that level cut through a sparring jacket. How would you suggest the average HEMA practitioner use this as a training tool? Sean: “Honestly, amongst practitioners with a large level of experience and control I see this as a very valuable exercise. Provided proper protective equipment and sword preparation (TIPS CUT OFF!) it is a very enlightening experience. The main drawback is the cost of the blades. We chewed them up quite a bit, though RJ did later manage to recover most of the damage and hold a successful cutting class using one of them. RJ: “First, and foremost--I would not suggest that the average HEMA practitioner spar with sharp swords. Even with all of the testing and safety we did beforehand, I have students that could have killed me in that experiment on accident. That being said, there is use for this test in multiple capacities. The first thing I would recommend is to watch our video and read this article- much of the information that you will gain is already here! “When you’re ready to take it a step further, I would suggest approaching your HEMA school’s instructor, and inform them that you would like to feel a sharp on sharp bind. Once you find suitable swords (my business, South Coast Swords can get you some Cold Steel sharps at an excellent price for this exercise), then you can carefully complete some binds with a partner. I would suggest using full gear and swinging gently as to not cause too much damage. Vary your pressure and direction of movement once in the bind. Also, attempt multiple binds at various angles between the blades. Once you have a feeling for it, keep that in the back of your mind. Use it as an aid whenever training. Won’t sparring with sharps destroy your swords? I always parry with my flatamastrong! Edge damage post sparring (and being lit on fire). I then began reprofiling the face of the blade at a new angle while removing the notches. About half way through grinding the face down. Continued to grind at an even angle until I ended up with no more notches. Nice crisp edge to work with. Finally, using the belt sander, I set a new final edge into the blade and polished it to a mirror finish. Here is a comparison between the final edge and an edge I haven't worked on side by side. As you can see the sword can be ground down carefully and still be fully functional after massive edge damage. We then went on to have a successful cutting class at my school using this sword with no problems. To conclude the article I would like to list out the majority of techniques that we tested, and give our feedback (where applicable) on each technique. RJ: As above, plus there was slightly more control of the opponent's blade when winding. RJ: We noticed that it was much easier to feel the direction and intention of your opponent, therefore targeting the hands was easier. There’s also some “cooperation” that comes with having a sharp blade biting into your wrists. Sean: Also having the sharp edges means that the blade doesn’t always slide to the cross as the opponent's sword tip rotates, making much more space for the blade to move around the quillins and two the wrists. RJ: Less difference than expected, but still noticeable. Just lended to a little more control of what your blade and your opponent does after the impact. RJ: Minimal difference. There’s not much bind that occurs here, so there wasn’t much that could change. RJ: I went into the fight wondering if blade grabs would feel safe and viable. I happened to run into an instance where I wanted to do a grab. I executed it without fear, and it worked well (only with thin leather inside my gloves). Sean: I told him so. RJ: All winding felt more controlled and easier to have a sense of fuhlen of the opponent’s intentions.